Put simply a theropod was a flesh-eating dinosaur. This lizard-hipped group of dinosaurs included some of the largest carnivores ever to roam the Earth. 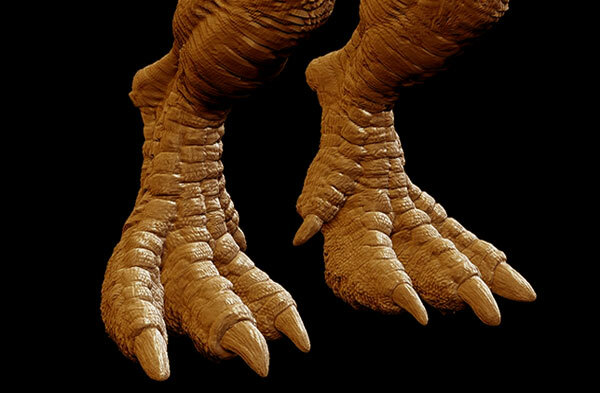 Although theropods often had weedy arms, they did have strong muscles to power their rear legs. They also had large teeth and strong jaws. Most, such as Carnotaurus, had three-toed feet ending in claws. Not all theropods were huge – some were as small as chickens and survived by snapping up lizards and maybe insects. How big were a killer’s teeth? Carnivore fossils generally show curved, dagger-like teeth that would have sliced prey to shreds. The size of the tooth was generally a guide to the size of the animal and could be up to 20cm (8in) long. 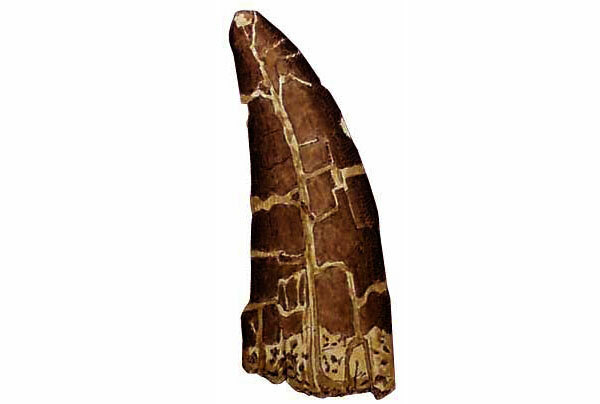 This tooth, which is 9cm (3.5in) long, comes from the mouth of Megalosaurus – a large theropod from the Jurassic Period. A bipedal animal is one that walks on two legs. All the meat-eating dinosaurs were bipedal, although there were some plant-eaters that also walked on two legs. Bipedal dinosaurs were faster and mostly more intelligent than their four-legged cousins. The first dinosaurs, such as Eoraptor, were bipedal, as were some of the later ones, such as T. rex. Could a carnivore make a meal of a plant-eater? A big hunter, such as Allosaurus, would have had several advantages over lumbering plant-eater Stegosaurus. 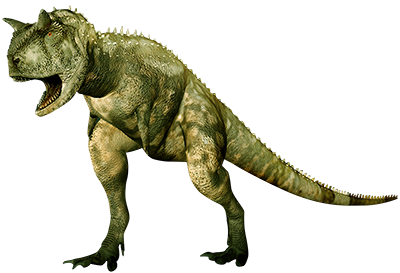 Not only was Allosaurus faster and more quick-witted, it was also better equipped for killing. Allosaurus could slash out with its claws before sinking its razor-sharp teeth into its victim’s flesh. 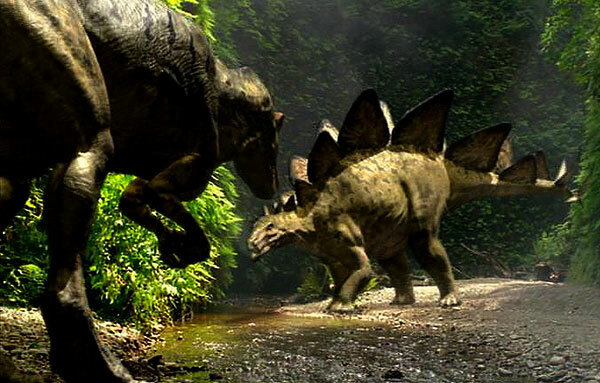 Stegosaurus might have fought back by swiping out with its tail spikes, but that was unlikely enough to prevent it ending up as food for its killer. Which dinosaur has the biggest brain? The dinosaur with the biggest brain was probably Giganotosaurus, although this was definitely not the smartest. That honour goes to the troodontid group, which had the biggest brains for their size. 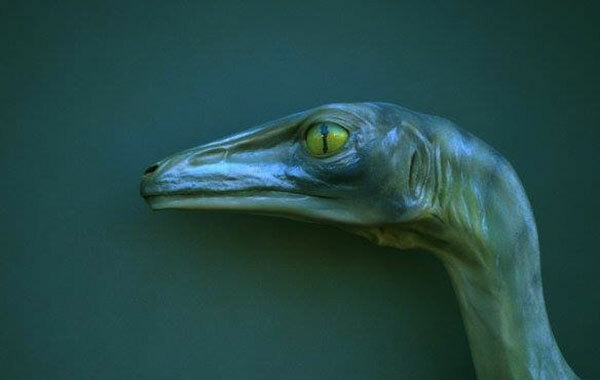 These dinosaurs also had large, forward-facing eyes that could focus on prey and may have helped Troodon to see at night. 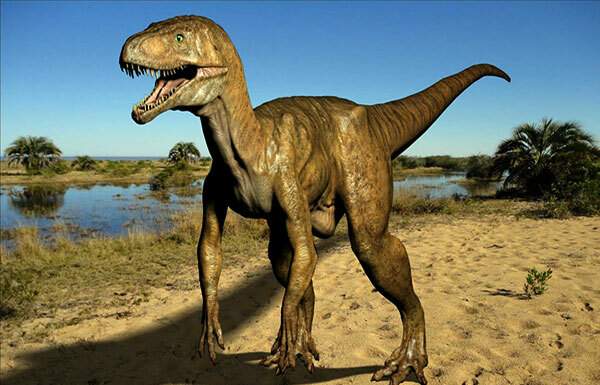 It is possible that the big carnivores – Allosaurus, T. rex, and Giganotosaurus – hunted smaller carnivores, such as Santanaraptor, as well as herbivorous dinosaurs. These big carnivores were the largest, fiercest animals around, which made them top predators, safe from hunters themselves. Only a severe wound or debilitating illness could have made a big carnivore potential prey. How did a theropod run? A dinosaur’s fossilized bones and joints provide clues about how the animal moved. For example, palaeontologists can work out how far the limbs could reach. Large thigh bones indicate strong, muscular thighs and long shin and foot bones suggest that the dinosaur was a fast runner. Albertosaurus ran with a horizontal back, head held high, and its body balanced by its stiff tail. Three walking toes spread on the ground for stability as the second leg is lifted. When off the ground, the toes bunched together to minimize air resistance and increase speed.